Today, we interview Lily’s trainer, Terry Ressler. Terry is the father of our own Pastor Phil Ressler. 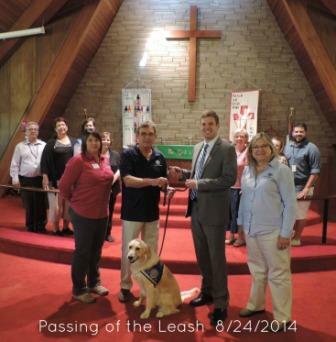 Pastor Phil had Chloe Comfort Dog at his previous church home, Lord of Life, and he introduced Good Shepherd to this ministry. It is with great honor that we interview Terry and his wife, Elaine! 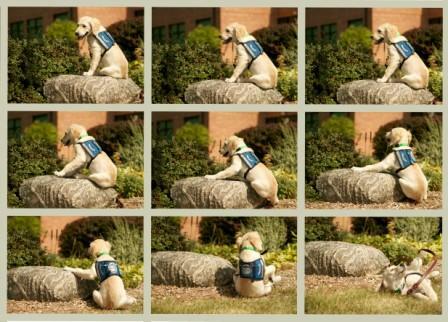 Dog Blog (DB): Terry, can you tell us how you became involved in the Comfort Dog Ministry and as a Trainer of Puppies? 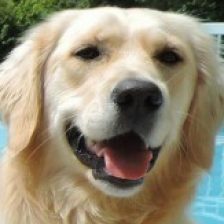 Terry Ressler (TR): Elaine began working with the Comfort Dog Ministry as a handler for Kye Comfort Dog when Immanuel first received Kye on May 17, 2012. I retired early in 2013 and Elaine encouraged me to get involved in the Comfort Dog Ministry, so I became a handler for Kye and Bekah Comfort Dogs. We had received information from Lutheran Church Charities (LCC) regarding the need for apprentice trainers and I considered it but decided against it at first. We then attended the LCC National Comfort Dog Conference the end of July 2013 and they talked about the training that would be beginning in August. I felt God nudging me to take a leap of faith and so right there at the conference I talked to Dona Martin about becoming a trainer and then filled out the necessary paperwork for approval. I began my apprentice training on August 8, 2015 with Lily Comfort Dog. Elaine helped with some with the training, however in August she took on the challenge of being an apprentice trainer and has her own Comfort Dog to train, Elizabeth ComfortDog. So we currently have two comfort dogs in the house. . .Job and Elizabeth. DB: Can you tell us about the training process? TR: Training begins at about eight weeks of age. You are assigned a puppy by LCC. Excitement is high that first day you meet your new puppy and take them home with a kennel, food, and puppy supplies provided by LCC. There are weekly training sessions you are required to attend at the LCC headquarters in Northbrook, IL. At these two hour training sessions we meet with all the other comfort dogs in training and gradually learn all the commands they will need to know as a Comfort Dog. The dogs love their training sessions and of course their play time after. “Homework” is sent home with the trainer with a list of items that you will be working on throughout the week. On occasion we will go on a field trip to Target or a nursing home or other locations. During the week we go to a one-on-one with the master trainer. I trained Lily from August 2013 until she was placed in August of 2014. Usually you are not allowed to train a dog for the entire training process. Dogs are switched halfway through training to ensure that they are used to being handled by different people and also to give them more and different types of exposure. However, I was given Lily to train for the entire process because she went to Good Shepherd in Old Bridge, New Jersey where my son is their Pastor. DB: What trait did you see in Lily early on that told you that she would make a great Comfort Dog? TR: Lily loved people. She enjoyed meeting and greeting people of all ages from a tiny baby to someone in a nursing home! DB: Lily was your first…what other puppies have you trained? “switch” and have Job since he was 7 1/2 months old. DB: We often get asked by those we visit if it is hard to give Lily up at the end of the day. Was it hard for you to let Lily go after spending a year with her? TR: Yes it is very hard to let go! At the same time it is very gratifying to pass on a part of yourself knowing that it will be used to share the presence and compassion of Jesus Christ. end we know they will move on. DB: What was Lily like when she was a puppy? Was she hard to train? 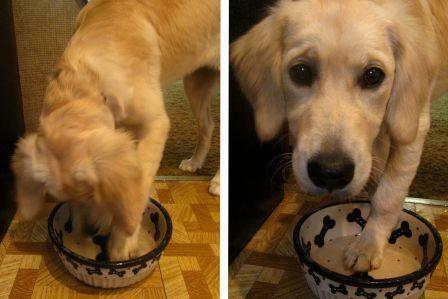 Lily looking for the bone in her water dish! TR: Lily was a typical puppy, as she got into things she wasn’t supposed to. She deﬁnitely loved to chew, especially when those new teeth were coming in. I have a few “marks” in my house to remind me of her!!! As far as the training process, she was a quick learner and loved meeting and greeting people. If I could go back and train her now, since I have more experience, I think her training process would have been even better. DB: What was the hardest thing for Lily to learn? TR: The hardest thing for Lily to learn was to not pick objects up off the ground. Our grandchildren knew they couldn’t leave toys lying around or Lily would pick them up. But being a quick learner, she eventually new what was her toy to pick up and which ones were the grand kids. She also loved to have her “nose to the ground” which is a Comfort Dog no, no!!! Especially when we were at a place that had lots of smells, such as a garden center. At the time the command to not smell the ground while walking and not pick things up was “leave it”. That command was given so much that sometimes I would call her “Lily, leave it”!!! DB: What was the funniest moment with Lily? TR: There were quite a few, but one that stands out is when we were at the church grounds taking photos when she was a small puppy. I had her to a “sit/stay” on a large landscape rock. As the photographer was taking her picture, she started to slowly slide off the rock. She knew she was not to move from where she was placed and it was like slow motion falling off the rock. The photographer was snapping and caught it on ﬁlm. Another funny thing that she would do all the time is with her dog dish. We had a one that had a bone painted on the bottom. She would try and try and try to get that bone out of the water. DB: Terry, do you have any thoughts on Lily’s ministry? Has she lived up to your expectations for her? TR: We love to follow Lily on Facebook – to see the places she goes and the people she visits. We know that she is doing the work that she was trained to do. We can see that her handlers have the same passion as we do in using these beautiful animals as a bridge to connect people to Christ. DB: What one piece of advice can you give Lily handlers? TR: Lily is that bridge to connecting people to Christ. . .but remember it’s not about the dog! Terry and Elaine, we thank you so much for your dedication and passion for this ministry, and we thank you for sharing your son and his family with us.